Identification of ant species is vital to implementing an Ant Pest Control program. Some species nest in the ground, others are more likely find a home in your roof void or wall cavity. Locating the colony nest is sometimes not possible as ants may nest in concealed areas. When a nest is found, particularly in the soil then a liquid insecticide can be used directly into the colony nest, ensuring effective eradication. The black house ant is black in colour and 2-3 mm long. The nests are normally in the ground, under bark or in decaying timber. They can nest in the roof void, wall cavities and under paver. Black house ants are sugar feeders. The coastal brown ants are 2-3mm in length. The soldiers have very large heads. Coastal brown ants often nest between paver and along pathways and will throw out soil. They also infest wall cavities, leaving piles of debris at the nest entrance. Nests can become very large. They eat proteins and fats. 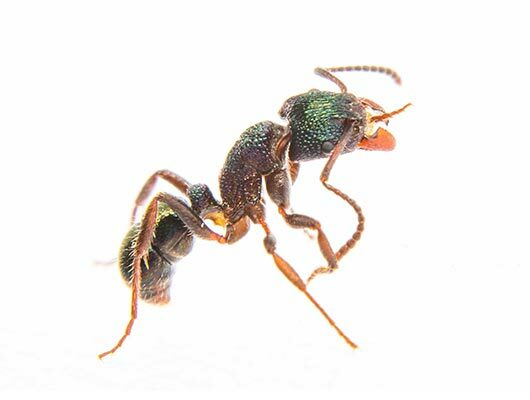 The green-head ants are 4-6mm in length, with a metallic green head and metallic black-green thorax and abdomen. They do not usually enter houses but can be a nuisance in gardens, where they nest in lawns and rocketries. Nests are easily located. Green-head ants can inflict a very painful sting.